Have you seen some of the beautiful lavender farms out there that people have been visiting this summer, they are exquisite?! I have one near me in New York and it was quite inspirational. My little niece and nephew loved running around the field full of purple and the scent of lavender was amazing. I thought this would be the perfect setting for fairies to spread their magic. 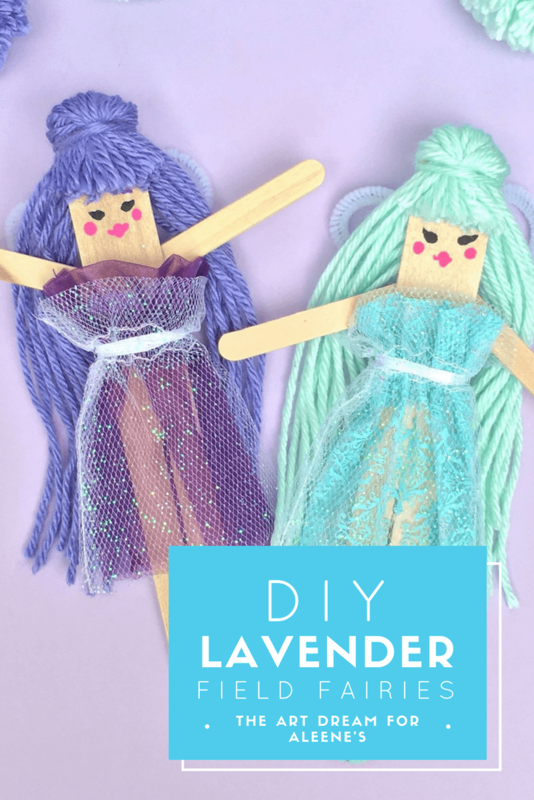 Use Aleene’s tacky glue to assemble these fairies made from mini popsicle sticks and a tongue depressor! Step 1. Paint a face on your tongue depressor, I used the end, not the bristles of a paint brush to paint an easy face. Step 2. Glue on mini popsicle sticks for arms, let it dry well. Step 3. Cut a gap in the tongue depressor with a craft knife to create two legs. Step 4. Twist a pipe cleaner into wings and tie it to the tongue depressor. Step 5. Cut the seam at the bottom of a tulle treat bag to create the dresses, just slide them on, pull the strings and tie in the back. Step 6. Wrap some yarn around your fingers and cut it, then tie all of the strands together towards the top, tie the hair to the top of the tongue depressor. You can add some glue for extra support. Step 7. Paint little shoes on your fairies.